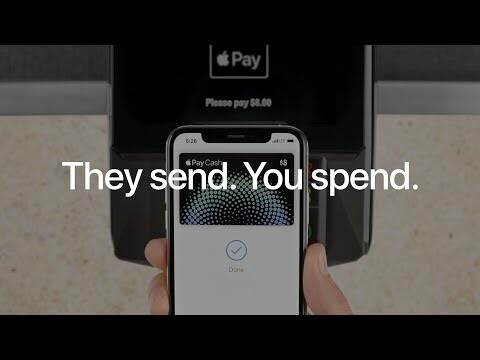 Apple on Wednesday released a trio of videos to its YouTube channel, hoping to hook more people on the idea of using Apple Pay Cash. The clips, under the slogan "They send, you spend," are each just 15 seconds long. 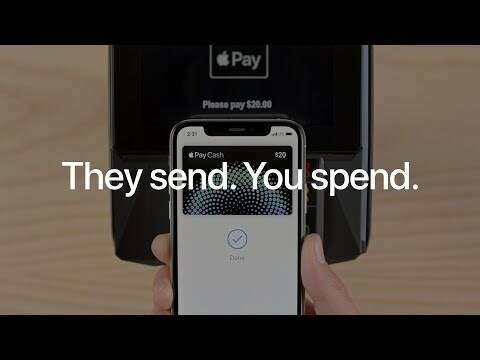 They depict mock Messages conversations in which people send and request money via Cash, then use a virtual Wallet card on their iPhone to pay at retail. 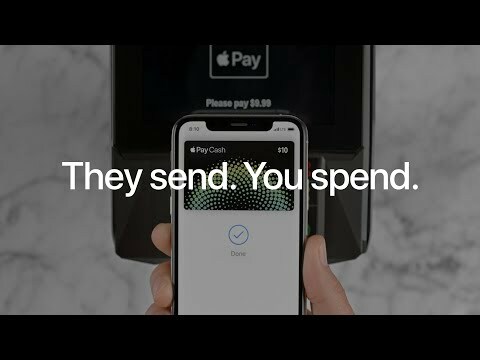 Apple Pay Cash was first introduced alongside iOS 11.2, and lets iPhone and iPad owners send money through Messages as an alternative to outside services like PayPal or Venmo. Money is stored in a PayPal-style account, where it can be used for other Apple Pay transactions or transferred to a bank account. The company has invested comparatively little marketing in Cash outside of press events, but does periodically release ads to increase awareness. 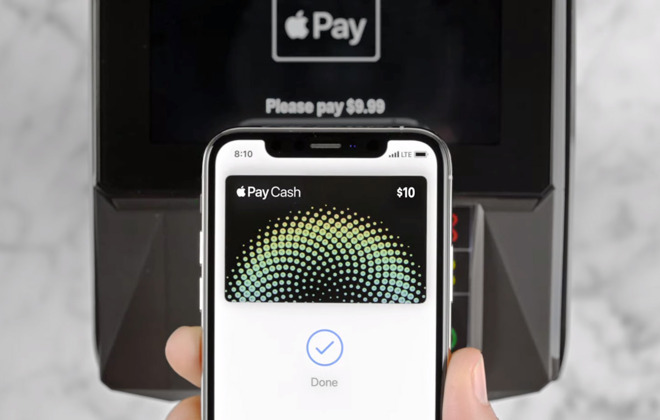 Apple benefits mostly from keeping people attached to its ecosystem, but also by encouraging Apple Pay in general -- the company claims a tiny percentage from each transaction linked to a credit or debit card. How much is a „tiny percentage“? ...it should be free for small amounts to motivate to use it and quicken a higher adoption rate. The company has invested comparatively little marketing in Cash outside of press events, but does periodically release ads to increase awareness. This is quite typical of Apple. Put out a product, it’s so self evidentially wonderful that it doesn’t need further promotion, service expansion or development. And then it withers. Its like Apple Maps, periodic announcements that some shopping centre in noweheresville has got an Apple Map! Instead of all malls in multiple counties have got Maps. All that happens is that Apple competitors have time to develop competing products that end up with broader uptake and Apple shareholders lose the income and share price benefit of the innovation. Do I use Apple Cash? Of course not. Apple hasn’t bothered doing the regulatory work to make it available in my country. It’s almost as though we are not one of its biggest markets outside the US. It’s like they actually don’t care about selling stuff outside the US. Ah well, more fun being Davos Man. And yet it’s still impossible to add ApplePay Cash to a MacBook Pro’s wallet! I can imagine such a service might be used by students or in places where banking is less common. I didn't even know there was such a thing as a wallet on MacOS. Go discoverability. People already use either venmo or cash app, maybe paypal sometimes. A little extra tepid marketing from Apple is not going to move the needle much, unfortunately. Unlike many of Apple's other services, which are severely lacking in implementation, Apple Pay/Cash is of course excellent. But it's crazy how few people seem to be using it still (relative to the potential). So much potential to surprise and delight, squandered. Who the hell is in charge of this again.. oh, that's right.. I have no experience with either Venmo or PayPal, so serious question: do either of those (or any other similar service) offer what Apple Pay Cash does? That being, if you and I are standing at a register that accepts NFC payments and you send me money via APC, I can immediately turn around and use that money to pay for something at that register using the APC card. APC is amazing. I use it often. Yes, theoretically if you were at a place that takes Apple Pay you could use it right away. I only use Venmo for people that have a Samsung, everyone else at work for example we use APC. Payment processors (such as PayPal) have been lobbying to enable them to function more like a bank -- without becoming a bank. Currently, their payments have to be processed through either a bank or a credit card. If/When that happens, ApplePay could benefit from it as well -- because, like PayPal, they would not have to pay the bank's processing fees and could do it all internally. The negative side of that would be less a secure and stable system -- since the payment processors would be functioning as banks but without the checks, balances and controls (as well as FDIC insurance) that insure a stable and secure system. For instance, if your payment doesn't make it all the way to the payee, how do you recover your money? Or, if the processor is holding a cash balance for you after somebody sent you money and then goes bankrupt, how do you get your money? Or, more correctly, DO you get your money? FinTech is one of the fastest growing industries -- and may have the highest potential of all. The banking and financial industries have a 100 years of experience in developing and refining fail-safe procedures. But FinTech is, right now, like the Wild West where (almost) anything goes. How does that work? Using the method I described I wouldn’t even have to do anything. I have APC set up to automatically receive payments so as soon as the payment hits my phone it’s on my APC card. Without interacting with my phone at all (aside from Face ID-ing to verify it’s me) I could receive a payment and turn around and use it to make a payment at an NFC terminal. Is it that direct with Venmo, et al, or are there other steps involved. Or am I missing that Venmo can be used to facilitate NFC transactions? Also, I don’t really understand the point of putting these ads up on a YouTube channel. If I understand this correctly, one would have to go to that channel to see these ads, yes? I don’t know anyone personally who regularly checks out Apple’s YouTube page. It seems like these are the types of ads that Apple should be running on TV spots or other places that more people would be seeing them. It seems to me like this is the type of advertising that Apple needs more of. Here’s a personal anecdote of why I think Apple doesn’t do a great job in letting people know about Apple Pay/Apple Pay Cash. We have a cleaning lady who comes once a month, she loves her iPhone and loves CarPlay but she had no idea about Apple Pay. I explained it to her one day a couple of years ago and helped her add two cards to Wallet. I told her a few places close by where she shopped and where she could use it. A couple of months later I asked if she had given it a shot. Her reply was something along the lines of “Nah. I don’t always think of it and I have my credit card with me anyway.” Then Apple Pay Cash became available, I talked to her about it and convinced her to let me pay her that way, just to try it out. She was hesitant at first but we tried it one week. The next time I saw her she said to keep paying her that way “for now”. She said she was using the APC card as a sort of savings account, that she didn’t really think of it as money she could be spending. OK, whatever. Then she realized one day she could pay for GroupOn purchases with Apple Pay and could use her APC card. Boom! That’s all it took. Now she uses her APC card with GroupOn, then she tried it at the grocery store and now she’s hooked. She LOVES it. She wishes more of her customers would/could send her money via Apple Pay Cash. But that’s the thing, so many iPhone users have no idea that Apple Pay is even a thing, other than a neat novelty they heard about once when iPhone 6 came out. Same goes for Apple Pay. But many of those same people know about or use Venmo and others. It’s just perplexing that Apple seems very interested in expanding Apple Pay/Apple Pay Cash adoption but they certainly don’t go out of their way to raise awareness with consumers. My wife and I use it all the time to sort out our shared household expenses. We can run through a grocery shopping receipt in a few seconds...share out my individual outside-the-budget items...jump into Apple Pay and round up the budget, again, which is her domain. Piece of cake. Pun intended. Er, what evidence do you offer to support your claim that APC is "withering"? I just made use of it the other day -- my friend paid for half of dinner, and I used the APC virtual card at the store to get supplies via the NFC terminal. What are we doing wrong? And how do you mean withering is "typical" of Apple products? Which? Ping, ok. What else? Consider the few number of products Apple has, and the tremendous success of most of them, I find this claim dubious. Are you thinking of Google, and all the stuff they routine leave to rot and then cancel? I think Hangouts is being discontinued at the moment, yes? Or are you just whining about nonsense again?